Eddie (film) Wild Bill Evert, a promotion-minded eccentric, takes over a losing NBA franchise, the New York Knicks, and happens to overhear the advice of die-hard fan Edwina “Eddie” Franklin, who yells her opinions from the stands. When Coach Bailey is canned, Eddie, as part of a publicity stunt, becomes the new coach whom no one takes seriously. Standing on the sidelines watching her team lose one game after another, Eddie begins to show herself as a real motivator, with her infectious spirit pushing the team to win and helping to convince Wild Bill to keep them in New York. A Hollywood Picture. Directed by Steve Rash. Released on May 31, 1996. Stars Whoopi Goldberg (Eddie), Frank Langella (Wild Bill Burgess), Dennis Farina (Coach John Bailey), Richard Jenkins (Zimmer), Lisa Ann Walter (Claudine), joined by many professional basketball stars. 100 min. 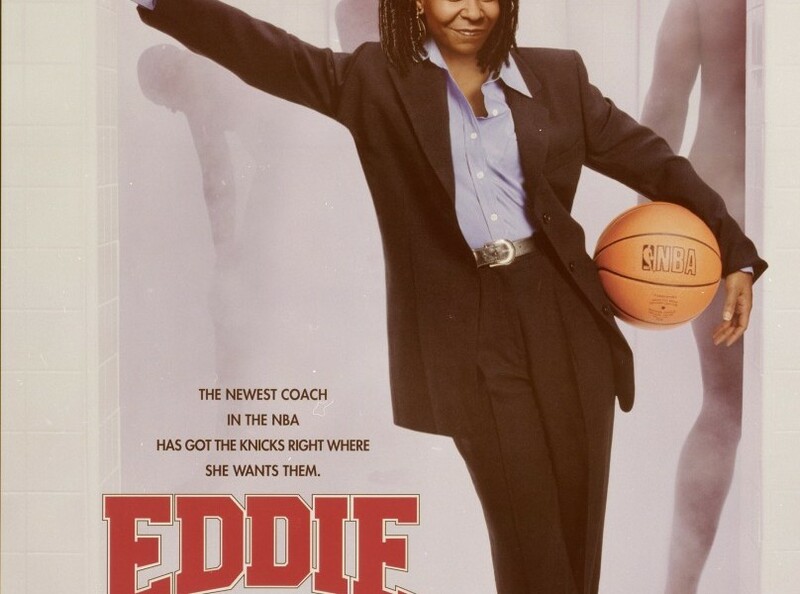 While the character of Eddie was originally written as a male bank teller, and the team was originally the Clippers, Whoopi Goldberg’s interest in the project changed everything. The motion picture was filmed in North Carolina, utilizing facilities at the Charlotte Coliseum and Winston-Salem’s Lawrence Joel Veteran’s Memorial Coliseum. Released on video in 1997.